Those who've followed this blog for a while will know that my attitude to open access publishing is luke-warm at best. However, today I can claim that I'm doing my bit for OA, because a colleague has had a paper published in the 'International Scholarly Research Network' Geophysics Journal. Which means you can read it free of charge here. Personally, I would have preferred to submit to a more established journal. ISRN Geophysics has published a total of 9 papers ever in its history. Geophysics (published by the SEG) has published about 30 papers a month since 1936. I doubt this paper will ever win me any points in a REF submission. However, it'll be interesting to see whether the fact that it is open access leads to a higher number of citations down the line. What I will say is that I was very impressed by the speed at which Hindawi Publishing turned the article around. I have an article still awaiting publishing in Geophysical Prospecting that has taken more than a year and is still not yet available. This article was submitted in mid December, and is now available online with DOI number by mid-February, which is frankly pretty damn good. One of the crucial things that reservoir engineers always want to find out about a reservoir is the permeability, because this controls how fast the gas and/or oil will flow to the well. There are a number of ways permeability can be estimated, but my colleague Doug Angus at Leeds University has been coming up with a way to estimate it using microseismic events. During hydraulic fracturing (fracking), microseismic events are triggered by the pulse of fluid pressure moving out from the wellbore. Much as the speed of the gas going into the well during production will be controlled by permeability, so the speed of the pressure pulse moving away from the wellbore during fracking will be controlled by permeability. So by tracking the distance of the microseismic events from the well through time, we can estimate the permeability. Much of the work on this has been done by Serge Shapiro of Freie Universitat Berlin. 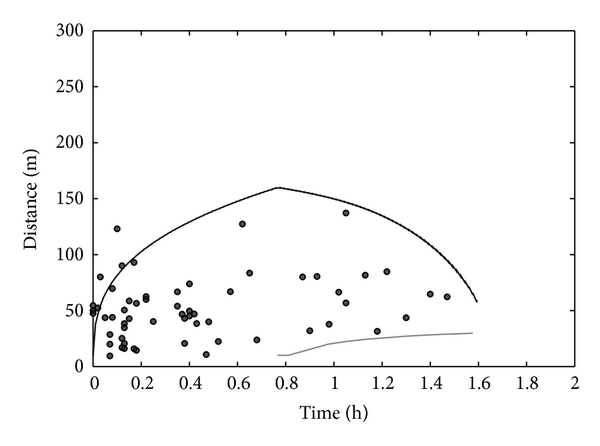 The Shapiro method assumes that microseismic events are triggered by small pore pressure perturbations, and solves the diffusion equation to determine how quickly events should move out from the injection well. However, what this doesn't take into account is the deformation of the rock itself. The increases in pressure will be causing poro-elastic deformation as well. 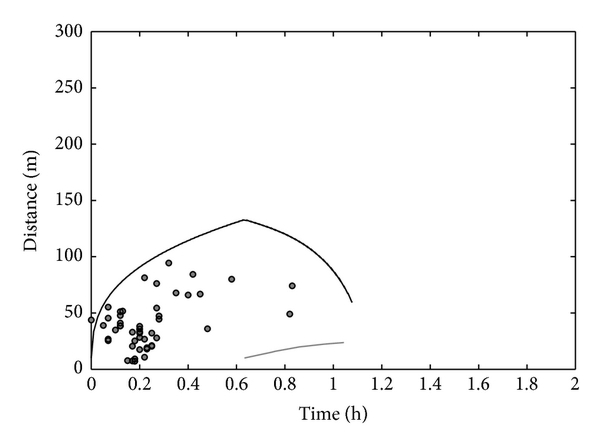 An alternative model developed by Alexander Rozhko of Schlumberger incorporates the triggering of microseismic events through stress changes produced by poro-elastic deformation. 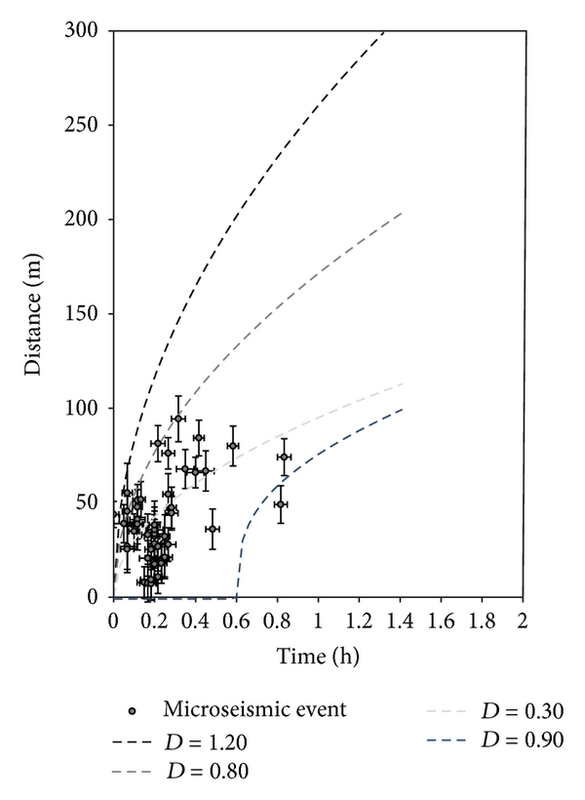 In this paper, Doug compares the two models, using them to predict the microseismicity induced during a multistage fracking operation, where in one stage water was used as the fluid, and in the other CO2 was used. Despite the different fluid properties, both methods should in theory recover the same permeabilities. Note that while both models fit the data reasonably well, both make very different predictions for what would happen to the microseismicity though time had the injection continued. With the diffusion model, event-injection point distance keeps increasing, with the poro-elastic model it becomes capped. The permeability estimates for both models are broadly consistent - approximately 50-100 milliDarcies (no, not a small Colin Firth). However, the estimates from the poro-elastic method are more consistent and more stable. 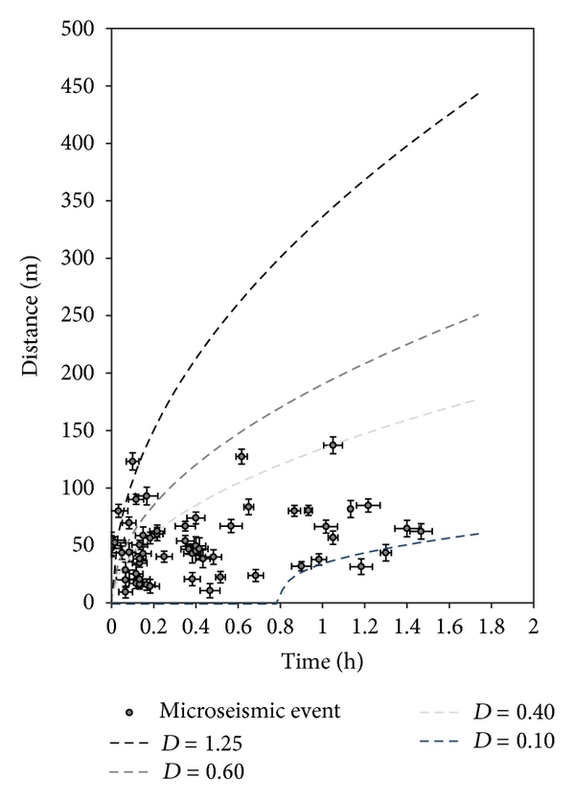 Therefore, based on this dataset at least, this method is Doug's preferred choice for permeability estimation using microseismic event locations. So there you are - my first OA paper, and an attempt to explain it in layman's terms. I hope you made it to the end. On OA publishing... as a student, i've found that being able to access a range of papers for free is vital to develop a better idea of where i want my (potential) geological career to go. So it's nice to see someone who's 'luke-warm at best' about OA, allowing a paper to be open to the wider world. Shame you're so bad at football. However, presumably you can access papers via the library? The library will be paying online subscription fees for these (which is how us staff are able to access them), so as far as I'm aware you should be able to access them too.